Ceramic Coating - Stay clean longer! - EVS Motors Inc. Ceramic Coating – Stay clean longer! Most of you have heard of the term “Ceramic Coating” in one way or another. Still, many don’t actually know what it is and how it works. To make it simple we will not go in depth of all coatings available. 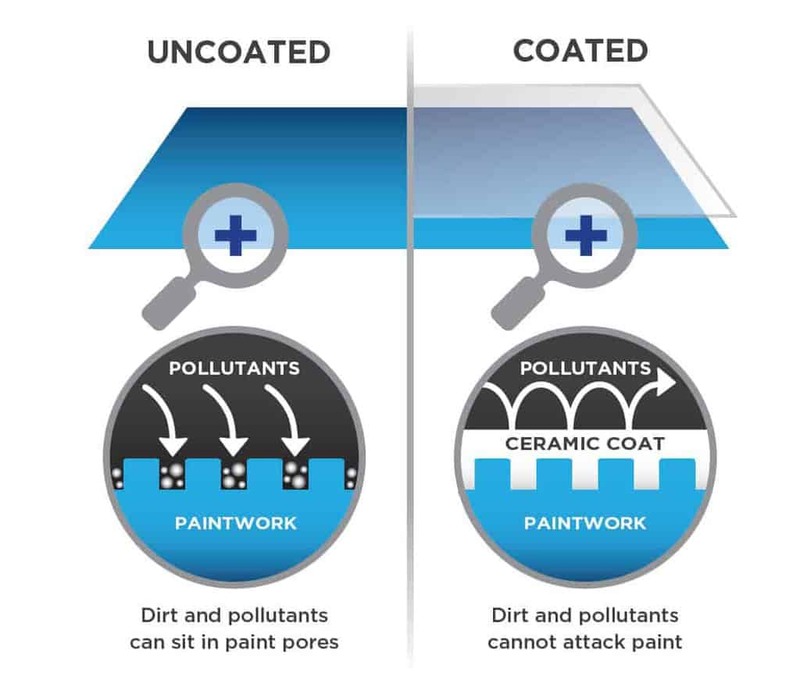 We will explain a little about ceramic coatings and how they work. What is Ceramic Coating all about? For the past few years the term “Ceramic Coating” was widely spread across the internet and social media. With crazy videos showing cars being driven through mud, mistreated and sometimes even set on fire, I would suggest not to test it at home. There are many brands out there to jump onto the hype for that wonder water and make some money off the consumer. Most of the times, misinformed on top of that. To understand what you are getting into, it is crucial to know what Ceramic Coating is and actually does. The easiest way is to understand it is to think of them as a second layer of skin. Sort of a sacrificial layer of protection over your car’s clear coat. They utilize nanotechnology, which are tiny particles that form a very thin layer invisible to the eye. Because these particles are so small, when applied to a surface, they seal all the pores. This makes the surface hydrophobic and helps protect from the environment. This layer is completely transparent. 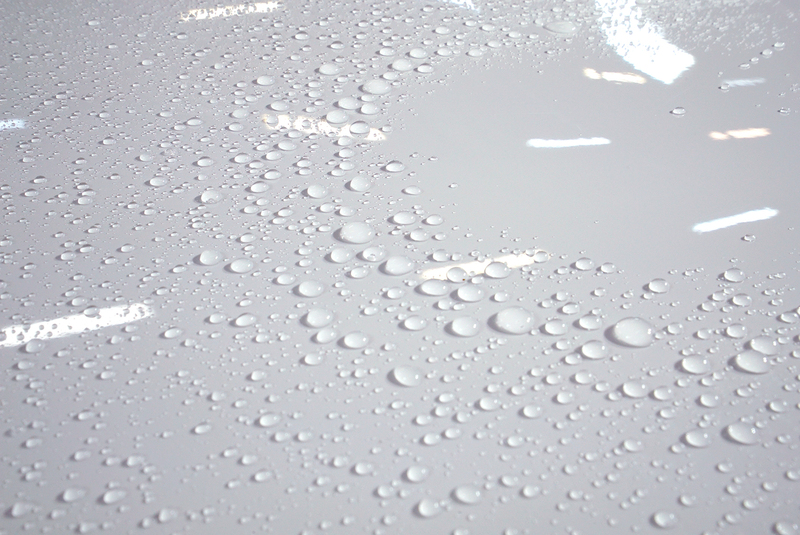 There are many claims that come with Ceramic Coatings. Some even say they protect from rock chips. I would not go that far. Even though some coatings reduce the chance to get new swirl marks, I would not expect your coating to hold up against rock chips and deep scratches. (For protection from impacts click here). It is a liquid applied to the clear coat of your vehicle after some prep work. There it semi-permanently bonds with the clear coat and adds an additional layer that can last for years. Since we are not going in depth of all coatings available, we will let you know what you should pay attention to when getting your car coated. Regardless of the coating you pick, if it has a warranty you will have to maintain it properly. This means, do not use acidic washes or products on your treated paint. Warranties will not cover mistakes made by you or another person that you let work on your car. It is recommended to bring your vehicle to a reputable shop to get a proper wash or wash it yourself. Of course the hydrophobic effect will help a ton when it comes to washing the car at home. Some shops offer to install multiple layers of coating to make it last longer and to add extra protection. Protection in this case means it gives you more sacrificial layers to work with. Let’s say you hard a bird dropping on your car and did not wipe it off. The coating will extend the time for you to need to wipe it off before it actually etches into the clear coat of the car. Most of the times if you are fast you can prevent etching and staining completely. In case you get a stain, with multiple layers you can simply polish off the coating and reapply it. Why is it a big deal? Why not just polish the clear coat? Let’s make it simple and say your car paint has 4 layers. Only one of those layers can be polished before you damage the underlying paint to an extend where only a paint job will fix it. The top layer has a specific thickness which means you can only polish (paint correct) it so much before the clear coat gets too thin and is in risk of clear coat failure (burning paint). Besides that many people enjoy the benefits of the easy maintenance, the fact that you can remove imperfections that just happen and are out of your control is just the cherry on top. It is easier and more affordable to remove coating and re apply a new layer instead of having to repaint a panel because the paint is too thin. Besides that it diminishes the resell value, it is such a hastle! If you had specific questions or you want a quote for your vehicle, come by our studio or call 888.878.2213 to speak to our specialists.